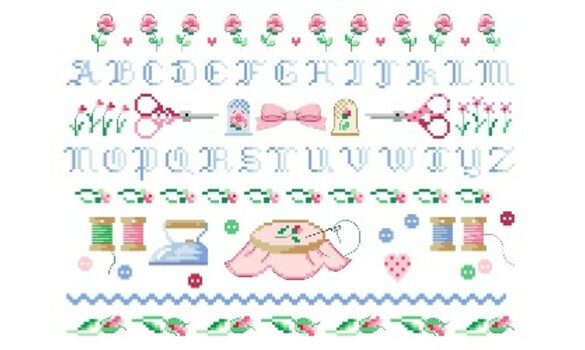 "Seeds of Roses" is a cross-stitch chart with instructions translated in English. It is part of a series comprising 3 patterns of the same size and a large sampler (see below the "Related Products" section).It was originally designed to decorate a stitcher's room. Special stitches:This is a pure cross-stitch design with some back stitches. This patterns show 19 colours (DMC references on the key). The design is stitched using two strands of cotton over two threads of fabric. The model on the picture has been stitched on a 14 count Aida colour "White" using two strands of cotton over two threads of fabric. The chart features clear and easy-to-read symbols in colours for an easier and more pleasant stitching. Recommended Fabric: 14 count Aida (or 28 count evenweave or linen), colour "white" or "off-white" 50x40 cm (20x16 in).